A friend left our chat group twice in one day joking around. 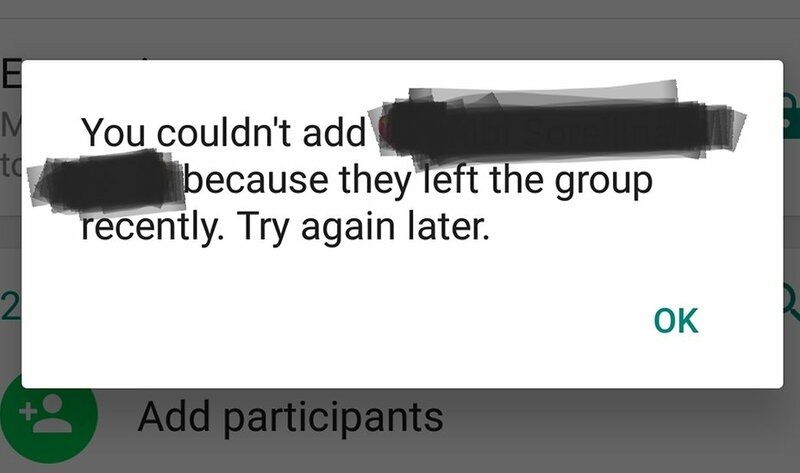 When i try to invite again it says they have left too many times recently and to try again later. How long must i wait? Its been a few hours. Would you like to post a screenshot about the error message ? Sure, thanks for the reply. I saw the screenshot containing error message. This is kind of weird since it generally doesn't happens. PS- Some apps have in built "if-then" conditions which are processed when the system gets confused or some particular error occurs. The condition here might be really same to it. Just restart your whatsapp and try the same again. Hope this helped. Have a good day!